I began to sing that country-western ballad while riding my BMW F650GS Dakar on the fourth day of this trip to the Pacific coastline in response to an invitation from friends that I met in Montana while Jim Hoellerich and I were returning from my 8th trip to Alaska. My entire sensory system was alive with anticipation as I headed the little cayuse west on the type of long solo back road adventure I enjoy most. My plan included seeing as much of Americana close-up as I could along the way. I had stopped earlier on the trip to visit with my daughter Donna and five of my ten grandchildren in southeastern Virginia. She had birthday cake and ice cream ready to celebrate my 81st birthday. These long, solo back-road adventures are a complete change of pace from most trips I’ve taken to Alaska and other faraway places in North America. This type of ride is much more relaxing, and I can see much more of the country than I do while riding with others where much of my focus is on them and their needs and preferences. The day after leaving Donna’s, I visited with my 92-year-old brother Ralph in Troutville, VA in the heart of the Blue Ridge Mountains. His home is less than a mile from the famous parkway that follows the crest of the ridge through much of Virginia and North Carolina. We sat on his veranda sipping wine and enjoying the beautiful panorama of the lower Shenandoah Valley while chatting for hours about old times and family in NY. Before reaching Ralph's, I stopped on my way across Virginia to visit the famous McLean House in Appomattox Court House where Robert E. Lee surrendered the entire Confederate Army to Ulysses S. Grant in April 1865, marking the end of the horrendous Civil War. I planned to ride the parkway southwest for several hundred miles from there to its end near eastern Tennessee, although one of the few low points of my trip happened when I unknowingly passed a small 25 mph sign on the otherwise 45 mph parkway, due mainly to my poor eyesight. I got a $100 federal speeding ticket for 47 mph in a 25 mph zone. The first I knew of the NPS police cruiser tucked in between the bushes was after I rounded a bend, which was obviously too late. I exited the parkway a short while later and opted for several scenic secondary roads in the same general direction for the rest of the day. The air was brisk and cool on the morning I rolled out of the Great Smoky Mountains of North Carolina into Davy Crockett country of eastern Tennessee. I was singing lines from “Don’t Fence Me In”, which I sang often during the next two weeks. The sun was directly behind me with my long shadow stretching far out in front. Small patches of fog lay in the valleys and the morning sun was just beginning to break over the hilltops. Everything felt, looked, smelled and sounded great, as my little 650 single broke the early morning calm, straining only slightly for the steepest grades. The sound of the bike's exhaust ricocheted off the surrounding hills as it carried me effortlessly into the wide-open country and eventually to places beyond the horizon. Happiness to me is a full tank of gas, a full stomach and an empty bladder, with hundreds of miles of two-lane country road ahead. I’d often go for as long as four and five hours before stopping for gas and a quick lunch, and I’d be relaxed and singing to myself most of the way. Taking a trip like this is something I’d rather do than just about anything else in the world. People would often ask, “Don’t you ever get lonesome out there all by yourself?” My answer would usually be, "I’m never alone. God is always with me wherever I go." I communicate with Him much more during this type of trip. I believe the Holy Spirit is my constant companion to guide and protect me whenever I need it most. I don't feel the same while riding with time constraints, riding with others, or with the destination as my primary focus. It becomes an opportunity to take a reality check on the never-ending process of striving to build and maintain a decent character - one that I can live with and hopefully in some way become a role model and an inspiration to my children and grandchildren, which is sometimes difficult to do in a world where so many seem to have lost their way, or are in pursuit of far less venerable goals such as money, self-indulgence or the pointless accumulation of lots of stuff they don't really need. I've thought often of taking a trip like this around the country for the entire summer, much like an itinerant drifter, using only the sun and shadows as a guide, with no route sheet or destination in mind; and doing it exclusively on back roads. It would be a huge challenge and a great adventure that's always been on my "bucket list". It would be much like what early the pioneers did when there were no roads. The challenge would be greater on days with no sun, when a compass would be helpful. It might often be difficult to locate overnight stops in the sparsely populated areas, so maybe a sleeping bag would be essential. I've read that Daniel Boone often walked from his home in Kentucky through Appalachia all the way to Philadelphia, using many of the existing trails, but also blazing several of his own. I seldom felt the need on a trip like this to travel any faster than 60 mph along the lightly-traveled byways, especially when I have plenty of time. Whenever I travel faster, I need to keep my eyes peeled to the road for control and safety. I not only miss out on much of the beauty of the countryside, but I also have less time for introspection. I get much better gas mileage at the lower speeds. On this entire trip I averaged between 72 and 73 mpg, which is the most I’ve gotten with any motorcycle on any trip, even the 225 Yamaha Serow, which I pushed to the limit during much of that trip. I often got up to 80 miles per gallon with the Dakar for the entire day. I had been riding it regularly for the past few years and I had grown quite attached to it. Having found it futile to locate a decent all-weather windshield for it, I asked Leif Gustafsson to make another, like the one that got smashed when I hit the sheep on the Alaska Highway. It’s not the panacea of windshields, but it’s better than any others I’ve tried. This time I stood by and watched the forming operation as he shaped the hot plastic by hand. Consequently, the end product came out a little more to my liking. It often takes months to plot out a back road trip like this to enjoy every part of the ride. I find that in the end, it's much more enjoyable than seeing how fast I can get there; although I've done both. I tried to lay this one out in a way that I can enjoy the flora and fauna on the prairies, deserts and farmlands as much as I enjoy the hilly terrain. There’s always something to see and enjoy wherever you might roam when you take the time to plan it. The temperature rose to 98° that day, and the late afternoon sun was directly in my eyes when I finally stopped at a motel in West Memphis, Arkansas, just beyond the Mississippi River. It turned out to be the longest day of my trip at 540 miles, almost all of which was two-lane country roads with no traffic. Some of the roads had route numbers and some didn’t. I passed through many villages and small towns as I meandered across the breadth of Tennessee. Much of it on roads I had never seen before. I gained an hour entering the Central Time Zone, which helped to put on some of the extra miles. Minor errors on my route sheet contributed to others. I would make impromptu changes to the route sheet whenever I came across an error. Then I'd use several rural roads with and without numbers to reconnect with my originally intended route, which took me through interesting places I would never have seen. The heat and maximum UV that day was a harbinger of many days to come. It was especially noticeable because I wore the full riding suit all day, every day. I didn’t have much room on the bike to stow it, so I wore it for the entire trip. I wore only a lightweight T-shirt and shorts underneath, and I would rinse them out in the sink almost every night. On cool mornings I would have everything zipped up, and I'd even be wearing the jacket liner, which would usually come off before lunchtime. I would keep the air-vents open on the bottoms in the afternoon. As it turned out, I could have done without the riding suit for the entire trip because it didn’t rain from the time I left New York until the day after I got home, a month later. The great weather seemed to follow me all the way across the country and back. Managing the body's hydration is always a challenge, especially in the summertime; but since I was on a medication for congestive heart failure that had a diuretic side effect, my concern was even greater. I usually tried to manage the level to the low side, which allowed me to travel longer distances without stopping. It’s not easy to find rest areas or other private places to stop in the open farm country. It's not like traveling in wooded areas or on interstates where places to stop are much easier to find. I chose AR Rte 14 for my fifth day and followed it for more than 200 miles across Arkansas. It’s one of several scenic east-west roads I've used through the Ozarks. Late that afternoon I turned north into the southwest corner of Missouri to find a motel in Noel, a small town a few miles from the Oklahoma state line. I chose one alongside the slow-moving Elk River where I could probably catch a supper of catfish from the dock directly behind the motel. I’m afraid the combination of fishing and long distance touring has its own myriad of challenges that would take a lot of extra planning, preparation and fishing gear. In the morning, I headed northeast for about 90 miles to reach US 160 in Oswego, KS. I chose it for my main route across the country this time because it’s a lightly-traveled, well-maintained scenic road that passes through many small towns and villages as it wends its way 1,465 miles across the heart of Middle America, much like Rte 66 did before interstate highways were built. Almost the entire length is two-lanes through rural countryside with light traffic. Mostly farmers or their wives use it when going to or from the small towns. I followed it this time for 3 days to beyond the Continental Divide. The corn was severely stunted in some areas where the ground was exceptionally dry. I saw how most of the crops thrived best where watering rigs were used, which happens mostly west of the 100th meridian, which runs through the center of the Great Plains from the Dakotas to Texas. During the trip I saw rice paddies, beans, wheat and other crops, and I saw farmers working in the fields with tractors, combines and other equipment. I saw rice growing in the hot lowlands of the lower Mississippi River Valley. I saw many places where the hay had been cut and left in the fields in huge bales. I also saw cattle grazing in the lush green fields of eastern Kansas, as well as in some of the drier areas like Nevada where they often graze on the open range, and steel cattle guards help to keep them off the highways. I saw very little green grass in Nevada where the terrain tends to be drier and the flora is considerably different. I’ve often heard people refer to riding across prairies and deserts as boring. On this kind of ride, I see almost everything out there as anything but boring. Every cactus, every clump of sagebrush, and even tumbleweed has its own individual God-given life. Every plant and bush is unique and alive. The trees in the west are the most impressive - from the aspens in the Rocky Mountains to the junipers and cedars in the drier areas of Utah and Nevada, to the Ponderosa pines and Douglas firs that grow majestically throughout the Sierra Nevada Mountains from California to Washington State and beyond. Near the Pacific coastline I saw the huge, the centuries-old redwoods that still thrive in protected areas - some for the past 2,000 years. I found Rte 160 to be an excellent ride, although it was along this road and during this trip that I had one of the most harrowing experiences of my million-plus miles. I’m not sure exactly where or when I rode the millionth mile, but to the best of my knowledge it was somewhere on this trip, probably along US Rte 160. I started my seventh day in Medicine Lodge, KS, making a quick gas stop in Meade where I met a guy with a nicely restored, single-cylinder BSA XT-500. We were getting gas at adjacent pumps when he asked if I belonged to a singles club. At first I thought he was referring to my marital status, but he was looking at my BMW at the time, and I realized he meant a club that’s made up of single-cylinder motorcycle riders. I answered, "No, I don't." His next question was, “How does that little BMW handle in the wind?” I said it handles fine for me just about anywhere, especially on back roads and gravel roads. I said "I’ve never had a serious problem with it in the wind. It does get thrown around sometimes". I didn't realize it would be put to an extreme test not far from there. It had already been blowing quite strong out of the southwest most of way across Kansas, which I was constantly aware of, but it was nothing like what it would be a few miles west of there on a deserted stretch of US160 leading into southeastern Colorado where the terrain flattens out and there are no trees, houses or anything to break the powerful force of the wind. About 10 miles west of Meade it got so strong that it began picking up dirt and sand and blasting the side of my face with it. It increased to a frightening velocity until I realized I was caught out there in a full-blown sand storm with no shelter anywhere. I was in the heart of the infamous Dust Bowl of the early 1930s. The first thing I thought of was to stop and remove the duct tape that was holding my face shield open. After stopping, my feet kept slipping and sliding on the sandy surface and I didn’t have enough hands to keep the bike from blowing over, and working on the shield at the same time. The road was covered with sand. I tried to turn the bike into the wind but the sand kept making the surface too slippery, and my feet kept sliding out. I was miles from anywhere, and there was no place to duck into or get behind. As soon as I got the face shield closed and my glasses put away, I decided to leave instead of sitting and struggling with it, which was becoming increasingly more difficult. It was a tough decision. I knew the consequences could be a lot worse while riding. After getting underway, I thought the safest speed might be between 50 and 55 mph because anything less was not offering enough gyroscopic action from the wheels, and the wind was throwing the bike around a lot on the sandy surface. I figured that riding any faster wouldn’t leave enough weight on the road for tire traction. Meanwhile, the temperature was around 100° and it was drying me up like a prune, especially after having taken my diuretic medication. When the wind kicked the rear wheel out about an inch the first time, I thought about the blood-thinning medication I was on, and it reminded me that my bare thighs were exposed from the side zippers being wide open. I couldn’t possibly spare a hand to zip them up, and if I stopped again, I would need both hands to try to hold the bike steady. I had no idea how long the storm might last, but I kept going. My next thought was, what if the bike got hit so hard from the side that both wheels broke traction at the same time? Could the wind possibly cross it up so bad that it would throw me over the high side? I was aware that any kind of spill could be serious, especially while I'm on blood-thinning medication, but a concussion could be fatal. I was aware of all the risks before I left on the trip. I've ridden with them for years. My knuckles were turning white around the time I began to recite the Lord’s Prayer, followed by the 23rd Psalm where some of the lines are: “Yea, thou I walk through the valley of the shadow of death, I will fear no evil; for Thou art with me; Thy rod and thy staff they comfort me.” The prayers did comfort me some as I continued to ride. It reminded me of the time many years ago when the Honda Gold Wing I was riding in west Texas broke traction with both wheels from a powerful blast of crosswind while I was traveling at 75 mph along a wet, slippery I-10. That happened about an hour west of El Paso, near the New Mexico state line. It had been very windy all day and it was pouring rain at the time. I had just passed an 18-wheel semi as we both emerged from a railroad underpass. The truck was close behind when a powerful gust hit me so hard from the side that both wheels broke traction together, like I was on an ice pond. I could hear the blasts of air behind me as the trucker hit his air brakes, probably thinking I had lost it. I thought I did too, for a moment, but I was able to regain control enough with God’s help to ride it out. The bike kept sliding one way and then the other on the wet surface. I learned that skating around, totally out of control at high speed gets real scary! Somehow I managed to pull it out that time, but this time I was on a much lighter machine with a much older and much more fragile bag of bones aboard at 81 years old, but I survived this one too with God's help. The rear wheel of the little Dakar broke traction several times as the unrelenting wind and sand continued to blast from the side. I managed to hold onto the handlebars for the next 150 miles through the most powerful sand storm I had ever experienced. The rear wheel slipped a little a few times, but the 21-inch front tire never broke traction once, which was probably one of the factors that got me through safely. By the time I reached Springfield, CO I was totally exhausted, and I had a wicked headache. I also felt a little nauseous, which was probably from the thought of what could happen; and maybe also from dehydration. In any case, it made me realize again that the Lord is my Shepherd, and that He has protected me all these years, in spite of some of the disturbing situations I've gotten myself into. The wind died down a little by the time I gassed up in Springfield where the temperature was 102°. I drank a lot of water at the stop, but I continued to feel light-headed and nauseated for the rest of the day. By the time I reached Trinidad, CO, my planned overnight stop, I was totally exhausted. It was certainly a day to remember. I found a room at a Budget Host and slept well after 390 miles – many of which were truly unforgettable. The next day was a much more relaxing day of reflection and thanksgiving as I rode much easier through the southern foothills of the Rocky Mountains. I crossed the Continental Divide at Wolf Creek Pass (10,850 feet) and saw snow up close for the first time on the trip, in spite of the extreme heat a few hundred miles back. In many areas of Colorado the tree line is roughly 10,000 feet, but there were lots of trees at this pass. I went through a few towns and some more foothills before taking a motel in Cortez. Rte 160 passes the entrance to Mesa Verde National Park where I remember visiting at least a few times, both alone and with Lillian. I was on the road a little before 7:00. I located what the maps called County Road G about 5 miles west of Cortez and followed it across the state line into a part of Utah occupied predominately by Native Americans of the Ute Nation. The name changes to Ismay Trading Post Road at the state line, although neither section was marked. I didn’t see any markings from the time I left Rte 160. I got to a T intersection in the reservation and asked for directions to Ismay from a guy putting gas into a pickup truck at a small gas station. He said, "This is Ismay." It didn’t look like a town but his answer was enough to tell me to turn right, which my route sheet said would take me to Rte 95 and eventually Hanksville. 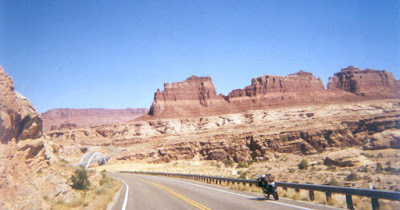 Like much of Utah, the roads that day went by many spectacular buttes and bluffs of all shapes and sizes with colors ranging from light tan to golden brown, and from light pink through several shades of salmon. At the mid altitudes I saw mostly cedars and pines. Above the 6,000-foot level there were many aspens. It was a nice ride with many colorful panoramas of southeastern Utah. One of the roads went over the 7,000-foot level and afforded beautiful views of the countryside. I took a few photos and enjoyed the scenery until I decided to pick up the pace and ride an extra 130 miles into Cedar City, rather than go off-course into Panguitch where I had originally planned to stop. I was due to meet my friends in Tonopah at noon the following day. Somewhere in central Utah I stopped when I saw a few BMW riders alongside the road. I learned that they were from Long Island and New York metropolitan areas. They were in Utah for a BMW rally scheduled for that weekend in Panguitch. They commented on my “funny-looking little BMW” so I proceeded to expound on its virtues, mentioning that it has been to Alaska and back, and that it handles exceptionally well on all kinds of roads. I suppose putting my aged and somewhat saddle-worn appearance together with Alaska and Buchanan, one of them asked, “You wouldn’t by any chance be Piet Boonstra, would you?” I answered that I was, and he said he had read my Motorcycling Stories book, which inspired him to ride to Alaska. Being recognized on the road more than 2300 miles made me feel good. We talked for a while before I moved on. I reached Cedar City around five after an enjoyable 475-mile day. I checked into a new-style Motel 6 there. After a quick breakfast at a nearby McDonald's, I headed northwest towards Tonopah. An hour later I was in Nevada where the terrain was drier and the temperature rose into the 90s. I stopped somewhere between Caliente and Rachel and spoke briefly with another group of riders parked alongside the road with big touring bikes. Their main topic of conversation was complaints about how boring it was crossing the desert. I had been enjoying every mile, even though I’ve been through that area at least a few times before. I filled up at an antiquated pump just outside the highly secret Area 51 facility in Rachel, NV, and I had a granola bar from my bag to hold me over. A short while later I came close to hitting a full-grown cow strolling down the center of the road that I didn't notice until the last second. She apparently got by one of the cattle guards or through a fence somewhere, and she seemed content on following the double-yellow line home. She never flinched when I went by very close. I learned from the desk clerk at the motel in Tonopah that my friends had checked in 15 minutes earlier. I asked the girl where she thought they might have gone for lunch. Without hesitation she directed me to a combined restaurant and bar not far from there. 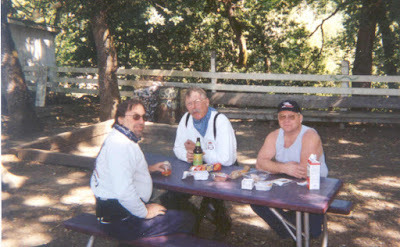 Jim Bellach, from the Fresno, CA area, riding a Suzuki DL1000 V-Strom and John Dey from Corona, a Los Angeles suburb, riding a nicely-restored classic Honda CB1100F were enjoying lunch with John's friend Alan Cheever from the Lake Havasu area of Arizona. Alan was riding a Honda XL650. I had met Jim and John in Montana in 2004 while returning from Alaska with Jim Hoellerich. During lunch I learned some of the details of Jim’s plan for the next three days. He said he would be the primary host during my visit. John, being somewhat of a protagonist of the practical jokes, announced later at the motel that as a special treat, they had fixed me up with a woman who would be arriving at my motel room at 10 PM. I said, “You can’t be serious!” I told him I plan to be in bed by nine, and there better not be a knock at my door. I thought he was probably kidding, but I wasn’t sure. After we were packed and loaded in the morning, we headed north out of Tonopah and stopped at a sit-down restaurant in the desert for breakfast and bonding. We continued north from there through Toiyabe National Forest to US Rte 50, and then west into Austin, NV where we stopped for gas. 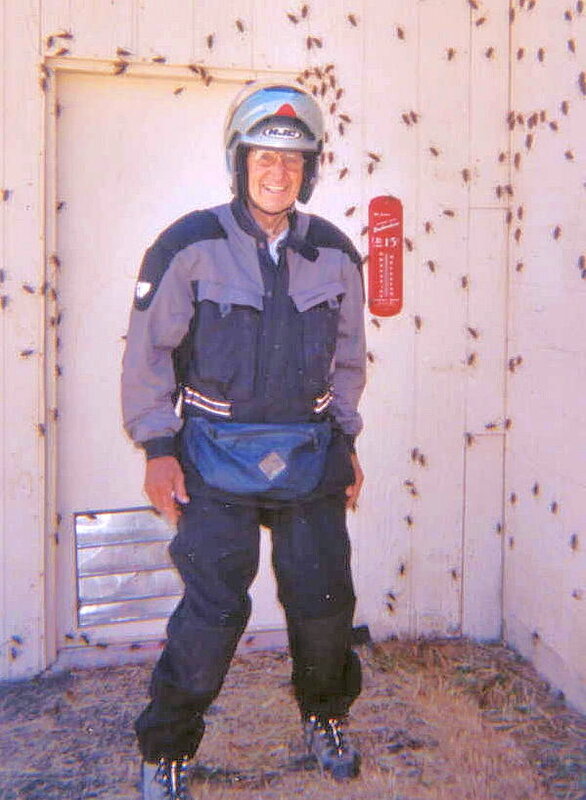 Austin was being inundated by millions of Mormon crickets. Jim said it happens around the same time every year. I learned that the huge shield-back katydids grow up to three inches long and they descend on Austin around the same time every year. They move along the ground and climb the sides of the buildings in huge schools. The road-kill around the gas station numbered in the hundreds and maybe thousands. It looked like squashed bugs could become a problem after a while. They were moving all over the ground and on anything they could cling to. 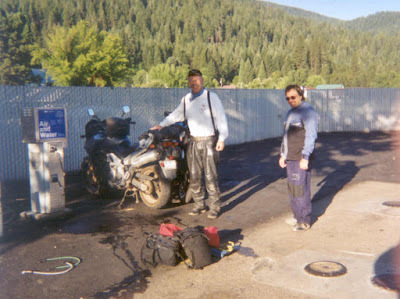 After checking into a motel in Quincy, CA, Jim noticed that his rear tire was soft. It had a huge nail in it. He and John plugged it that evening, but it was still leaking a little in the morning. We stopped along the way for a can of "fix-a-flat" that worked well enough to finish our ride. After stopping for gas in Mad River on our second full day, we were on a relatively straight stretch of pavement when John and I got horsing around in an acceleration test to see how well the 25-year-old 4-cylinder CB1100F Honda Classic could do against the more modern single-cylinder, 650cc single cylinder Rotax engine in my BMW Dakar. In the process both bikes got up to 105 mph in a relatively short distance. It was fun while it lasted, but we had to cool it for a series of turns coming up. The result was very close and made the adrenalin flow and gave us something else to talk and laugh about that evening, along with another round of John’s practical jokes and stories of past experiences. It was much cooler in Eureka than it had been on our first two days, which was a pleasant change from the extreme heat in Nevada. We sat outside the room and talked for hours while enjoying a bucket of Kentucky Fried Chicken and beer. After a few drinks, John insisted I accompany them to a nearby strip joint where he said they would introduce me to pole dancing and I would learn first-hand about lap dancing, or whatever. I was quite sure he was pulling my leg. The next day was the highlight of our three days together. We rode south for about 20 miles to a small, picturesque Victorian town named Ferndale and headed west from there toward the ocean on Mattole Road, a seldom-used, narrow, twisty blacktop with many tight off-camber curves and hummocks. It was a fun ride with practically no other vehicles for the entire distance to the Pacific Ocean where we stopped at a place called the "Lost Coast", which is a natural, development-free area of California's northern coastline that experienced major depopulation in the 1930s. Jim said it was now considered to be the longest undeveloped stretch of coastline in California, and he told us a little of the history. We continued along Mattole Road to Honeydew, a small town near the edge of the Humbolt Redwoods State Park, stopping only briefly at a few interesting spots along the way. At one of those intermediate stops, we pulled over onto a grassy area along the river where a girl was drifting toward us on a float tube. John said she was carrying a case of beer for a picnic they had arranged especially for my visit. I assumed that he was kidding, but as he was pointing and waving, she was smiling and waving back, like maybe they actually knew each other. This time I believed him, but when she got closer, she floated on by with a wave and a smile. We stopped at the Country Store in Honeydew for lunch where I ordered a deli sandwich with a local-brewed ale. We ate at a picnic table in the shade. While we were there, two much larger biker groups stopped by. John mingled through one of the larger groups, telling stories about me, my books and my travels, which resulted in an order from a rider from San Diego for "Motorcycling Stories". After lunch, we visited the Humboldt Redwoods State Forest and stopped for several photos. The Honeydew stop and the redwood forest was the pre-planned finale of our three days together. They had arranged with Alan to accompany me from there as far as Redding, roughly 150 miles from there. After breakfast with Alan in Redding, I headed northeast alone on Rte 299 through relatively flat desert-like terrain towards eastern Oregon. It was an enjoyable and relaxing ride with no traffic. I rarely saw a vehicle in either direction. I could see Mt. Shasta and the Cascade Range on my left for several miles. I spent most of the time reminiscing the three days the group spent together. The first town of any size I came to after 335 miles was Burns, OR, which appeared clean with wide streets and well-kept homes. It reminded me of a few places I've seen in New England. I checked into a Days Inn and chatted with the female manager before heading for a place to eat not far from there that she suggested. I originally anticipated an easy 375-mile day from Burns to Carey, ID, but finding no motel in Carey, I went another 100 miles to Blackfoot, which I originally thought would take only two hours; but I ran into road construction halfway. I didn’t see a warning sign near the start of the first construction area and I flew off a 4-inch drop into soft, deep dirt at a pretty good clip. Fortunately I was on the Dakar and rode it out safely. Later, as I was following a pilot car through another construction area, near the entrance to Craters of the Moon, my wheels dropped into a deep soft rut. The bike squirreled around a lot there too, but it came through again. Pilot cars were used in both places. Together they cost me more than an hour because I had to wait a long period each time for the pilot car to come from the other end, and then follow it slowly through, stuck between a string of cars, trucks and RVs. I got to Blackfoot around 6:00 and checked into a Super 8. My decision to go all the way to Blackfoot put me considerably ahead of my planned schedule and out of synch with my original plan for motels, so I took out the map of the western states that John insisted I take before leaving, and using a magnifying glass that Jim insisted I take, and I laid out a loop for the following day through an area of Idaho, Utah and Wyoming that I had never seen before. I saw many potato farms in southeastern Idaho where watering rigs were being used. They look beautiful in the morning sunlight with the huge sprays in all directions. 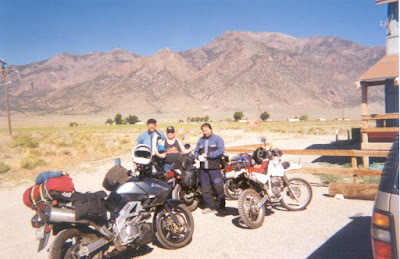 I rode south from Idaho along the west side of Bear Lake into the northeast corner of Utah. I skirted the edge of the Wasatch-Cache National Forest and went through Logan Canyon, and later into the southwest corner of Wyoming. I stopped for lunch at a privately-owned fast-food place in Kemmerer, WY and ordered a taco salad with lemonade and the senior discount. The girl behind the counter looked at me and asked if I was 65. I laughed and thanked her for the compliment and told her I was 81. She couldn’t believe it and called a few of her friends from of the kitchen to guess my age. I had hoped to make an overnight stop in Manila, Utah after a long, hot 400-mile day, but the only two small motels that I saw had no vacancies. I was exhausted from the heat and the long ride when the woman at the second motel said the nearest motel might be in Vernal, but she said they too were probably full because of work going on in the area by Halliburton. She said the overflow motel business was being felt for a 100-mile radius and it was unlikely I would find a room there either. The next town in the direction I was headed was Craig, Colorado, 120 miles east of Vernal, but there was a possibility they too might be affected. It would be another three-hour ride to Craig, which would take me into the night hours. I was already overtired and I was riding with a blown headlight bulb for most of the trip. This was the first time I might need it. It was almost 5:00 when I mentioned to the woman that I should be able to make it from there to Vernal in an hour. She shook her head and said, “That’s highly unlikely. It’s 67 miles, and the road goes through the mountains with switchback turns much of the way.” She said it was also patrolled and there were many deer. Her description of the road jogged my memory. I’ve been over it before. I figured I’d give it a try. Needless to say, I seriously wore rubber from the sides of the tires for the first time since leaving home, but it paid off, because I got there just before six, and got the last room at a Days Inn. The next day I rode 160 miles across more desert-like terrain into Steamboat Springs, CO, followed by another 100 miles south through the western foothills of the Rockies to Dillon where I got a room at a familiar Super 8 where I've stayed before. Early the next morning I rode 18 miles up the old section of US Rte 6 to Loveland Pass and waited for almost an hour for the morning fog to clear enough to get a few photos. The temperature was only 35° at the summit – the coldest of anywhere on my trip. I rode a short stretch of I-70 and exited near Central City. I had a nice ride down through another canyon to Boulder where I had been invited to visit with Chris and Erin Ratay. They are in the Guinness Book of Records for the “Longest Motorcycle Ride by a Team” for having ridden their two F650GS BMWs around the world together between May 1999 and August 2003. During their trip they visited 50 countries on 6 continents and went through 86 borders for a total of 101,322 miles. I had no trouble finding the street they live on but I had a little difficulty with the house number. Erin heard the bike and came out to guide me the rest of the way into their garage. I arrived just in time for a company picnic that had been arranged with Chris’ fellow real estate entrepreneurs and their families that was being held at a local park. We broke away from there early because they had invited other friends to join us for their backyard cookout. I met Chris and Spice Jones, a friendly young couple who are also motorcycle riders of some renown. They had already ridden together to Tierra del Fuego on the southern tip of Argentina. Chris is an expert off-road rider who was also signed up to ride the upcoming Paris-Dakar desert race in Africa with a KTM 650RR. A little later in the year, Spice was planning to take an adventurous motorcycle tour across Asia with Erin and a few other famous women riders. They were not free to discuss the details, which were still being worked out. Two other riders, Steve and Paul joined us, and we spent most of the evening enjoying the food and conversation. I left the next morning with a genuine admiration for Chris and Erin as the kind of people that I’m proud to know and proud to call my friends. They had graciously invited me into their home and into their circle of friends, and they treated me as their honored guest. I headed directly into the bright morning sunlight and failed to see several signs while leaving Boulder. But I soon found myself on I-25 headed north into the huge Denver I-70 interchange, in the midst of morning rush-hour traffic. I got onto I-70 heading east, which I intended to use as far as Limon, CO. I made a few more wrong turns later while making my way southeast across a lot of barren prairie toward southwestern Kansas. I eventually went an extra 100 miles of mostly secondary roads, and finally called it a day in Scott City, KS after only about 300 miles for the day. There wasn't much choice of motels, and I eventually shared a crummy room with a bunch of dead crickets. Around noon the next day I stopped in the small town of Beloit, KS to inquire about a road that I had been looking for and thought I might have passed. The road I was on went straight through the town like many small towns on the prairie. I parked in front of a Case-International tractor dealer and went inside to ask for directions. I didn't see anyone so I called out loudly, “Anybody here?” No one answered. I repeated it a few times, which echoed inside the building. There were many huge farm vehicles and pickup trucks inside, and at least three offices; but not a soul around. I walked next door to an open hardware store and called again: “Anybody here?” There was no one there either, so I walked across the deserted street to a gas station, which was closed and locked. I stood for a minute and looked around. Nothing was moving anywhere - only dead silence. I was beginning to get an eerie feeling that maybe there was no one in the entire town, like in the old TV series, The Twilight Zone. After a brief pause, a gruff male voice said, “Up the road about 12 miles.” I thanked him, and added: “Does everyone in this town go to lunch at the same time? I couldn’t find a soul anywhere.” I left while they were laughing. Shortly after leaving town I noticed a car driving close behind me with his left-turn indicator blinking. I thought he was about to make a left turn, or maybe he intended to pass, but he didn’t do either. He got even closer behind me with his turn signal still blinking. I didn’t see any place to turn and I thought he probably didn’t realize his blinker was on. I was about to turn my own left signal on to tell him that his blinker was on when I realized that mine was already on, so I turned it off and his went off. When he passed, accelerating like he was in a hurry, I noticed the word “Sheriff” on the side of his car. I guess I was lucky I didn’t get a ticket, or at least get stopped and checked out. I wondered if he was parked somewhere in town watching everything I did, or maybe he was in the diner. I got up the road about four miles and saw him tucked in behind some bushes. I threw him a big wave but got no response. I checked into a Super 8 in Chillicothe, MO late that afternoon, after an exceptionally long 540-mile day, all of which was two-lane country roads. It was one of the longest days of my trip. I stayed on US 36 for a while in the morning and turned onto US 24 just before crossing the Mississippi River into Quincy, IL. I missed one of several turns that US 24 takes in Quincy, and I found myself leaving town on an entirely different route. I stopped at a custom bike shop to ask how to find US 24 East. The middle-aged proprietor looked at me strangely and said, “I don’t think you want that road. Where are you headed?” I said, “New York”. He said with a strange look, “Not on 24 East I hope.” “Why?" What’s wrong with 24 East?” He said, “It’s rough. You don’t want that road.” I said “What do you mean by rough? Does it go through towns with a lot of congestion and traffic lights?” “No” he said, “It’s all hummocks and potholes, and it’s narrow and rough. No one ever uses that road.” I asked him if there were small farms with cornfields and cow pastures, and he answered, “There’s a lot of that, all right.” I said, “That’s the road I’m looking for. It’s not a problem. The bike has good suspension.” He said, “You’ll need it!” and he sounded serious. He was right about it being rough. The small rear mudguard of the Dakar snapped clear off from one of the potholes, and by the time I got to Indiana I was sore all over; but I did see a lot of corn and beans - mostly corn, and I wasn’t singing "Oklahoma" at the time. It was an interesting ride though. There wasn't a great choice of motels in Attica where I planned to stay, but I eventually found a small motel a few miles east of town. The next day consisted of a short ride to Montgomery, Ohio where I had arranged earlier to visit with Walt Maerki, a US Navy dive-bomber pilot during WWII who flew in the same squadron with my brother Dirk, who lost his life in the South Pacific while he was serving as a tail gunner in dive bombers. A few years earlier, while I was authoring a labor-of-love biography of my brother entitled, “Never to be Forgotten”, I was struggling to find information about what aircraft carriers and small islands he flew from during the last six months of his life. The Navy and Marines were advancing fast at the time, and his squadron moved around a lot – both aboard aircraft carriers and island-hopping where they used tiny airfields recently captured from the Japanese, or where the Seabees hurriedly built new ones as the entire Navy and Marines were focused on reaching Tokyo. I had seen the name WG Maerki on a condolence letter that was sent to my mother soon after Dirk was killed in December, 1943. I was sure that this pilot, who was the Senior Naval Aviator of the squadron at the time, could fill me in on the missing details. I found his phone number on Google, and I called him. We talked several times by phone. Not long after our first talk, Walt lost his beloved wife. I also recently had lost my mother, my wife, my oldest daughter and my best friend in a short seven-year period, so I knew his pain, and I wrote a condolence letter to him. Soon afterward, he invited me to his home in Ohio to meet with him and his family. I was planning this trip at the time, so I suggested that I could stop for a brief visit while passing through. I used mostly I-74 to get to Montgomery, a Cincinnati suburb. I arrived around noon and had no problem finding his address. As soon as I arrived, he called his daughter to join us. She was about to leave with her family for the July 4th weekend, but she stopped by for a brief visit. The three of us talked, mostly stories about my travels. Her family was waiting, so she had to leave after only about a half-hour, but Walt and I continued to talk for the rest of the afternoon. We went to dinner together at his nearby athletic club. After breakfast that he prepared in his kitchen, I was on my way to AMA headquarters in Pickerington, east of Columbus, to visit briefly with a few members of the AMA staff, after which I put on a few hundred miles that brought my total mileage for the day to 380. It left an easy 330 miles for my final day. My average daily mileage for the trip was about 375, with a 24-day total of 9,000 miles. With all things considered, it was a very enjoyable trip.